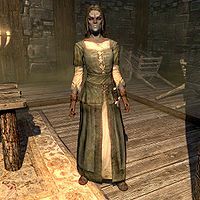 Suvaris Atheron is a Dunmer citizen who resides in Windhelm, in the segregated "Gray Quarter". She has two brothers, Faryl and Aval, with whom she shares the quarters of the eponymous Atheron Residence. Suvaris works for Torbjorn Shatter-Shield at the Clan Shatter-Shield Office, the main competitor of the East Empire Company in Windhelm. 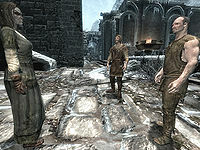 When first visiting Windhelm, you will witness Rolff Stone-Fist and Angrenor Once-Honored harassing Suvaris, as well as accusing her of being a spy for the Imperial Legion. This scene will occur regardless of the time of day, or any other appointments Suvaris has. 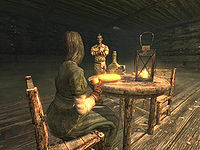 When not being threatened by Nords, Suvaris begins her day at 8:05am by heading out of her home down to her office. She will spend the next twelve hours working, breaking only at 1pm to have lunch at the office. After ending the workday at 8pm, she will head down to the New Gnisis Cornerclub to drink. She will finally return home at midnight, to go to sleep in preparation for the next day. Suvaris wears a set of farm clothes, a pair of gloves, and a pair of boots. She is equipped with an iron dagger. She carries a key to the Atheron's house, a key to the Shatter-Shield's office, as well as a selection of common loot and gold. Approaching Suvaris may have her greet you by mentioning the shipping capabilities of her employer: "Looking for shipping? We'll always offer better service than the East Empire Company." She might also grumble about the Argonian dock workers from the Argonian Assemblage: "These lazy Argonians better get their tails moving." She might also mention the recent loss of one of her employer's daughters at the hands of a serial killer: "You hear about the Shatter-shield girl? It's a tragedy." She will also talk about Torbjorn's desire for money from the shipping operation, as long as he is still living: "Torbjorn wants the shipping operations to bring in cash, and I make it happen." Should you speak to Suvaris after witnessing this scene, she will ask about your standing on the Dunmer issue in Windhelm if you are not a Dunmer: "Do you hate the dark elves? Are you here to bully us and tell us to leave?" If you tell her that you do not hate them, she will respond: "You've come to the wrong city, then. Windhelm's a haven of prejudice and narrow thinking, unworthy of one such as you." If you instead claim you share the prejudice displayed by Rolff and Angrenor she will end the conversation after saying: "Then we have nothing more to talk about." Telling her you noticed those Nords harassing her will have her explain that it is not a new occurrence: "Nothing new there. Most of the Nords living in Windhelm don't care much for us, but Rolff is the worst by far. He likes to get drunk and walk around the Gray Quarter yelling insults at us in the small hours of the morning. A real charmer, that one." Asking her why anyone would think she is a spy will have her respond by claiming that the Nords will cling to any reason to hate them, imaginary or not: "Some of these Nords will come up with any excuse to despise us. And it isn't just the dark elves they hate -- they make a target of the Argonians as well. In fact, just about anyone who isn't a Nord is fair game for their bullying." Ambarys: "What's new with the Cruel-Seas [sic], Suvaris? Have they given you one of those helmets with the horns on them yet?" Suvaris: "What do you want from me? I work for them ok? We're not friends. They pay me, and I get the job done. That's it." Ambarys: "Touchy. Maybe some Dunmer lives in you yet." Suvaris: "Either pour another drink or keep moving, Ambarys." Ambarys: "Don't you ever find it demeaning, working for that Nord family?" Suvaris: "Look, Ambarys, I just came here for a drink. I don't need any trouble." Ambarys: "Fine, then. I guess some Dunmer are content to be their pets." Suvaris: "Here's what's going to happen. I'm going to pretend I didn't hear that, and you're going to leave me alone. Deal?" Visiting the East Empire Company's office in Windhelm will lead to an encounter with Orthus Endario. He will apologize for the poor state that the office is in. He will inform you that the East Empire Company cannot afford to keep the place running in proper shape ever since a group of pirates started attacking their shipping operations. He will state that their competition, the Shatter-Shield shipping operation, are the only ones safe from the attacks, and will suggest that they are involved with the pirates. Asking him if he has proof will have him admit that he does not, but will instead have him request you gather it by obtaining Suvaris Atheron's Logbook: "Not yet, no. But perhaps an intrepid person such as yourself could help with that. They have a dark elf who oversees their operations. Suvaris Atheron. She's meticulous to a fault, and keeps a logbook with every transaction she makes. If it were to somehow end up in my hands, I wouldn't argue." Obtaining her logbook and giving it to Orthus will have his suspicions confirmed by entries mentioning Suvaris meeting with the pirates: "How did you get it? No, never mind, I probably shouldn't know. I see... it looks like Suvaris has been traveling to Dawnstar to meet with a pirate crew there. Get to Dawnstar and see what you can find out about these rogues. I'd wager they won't be too far from the tavern. Try to find out where their fortress is. The captain, Stig Salt-Plank, has to know something." While Suvaris was involved with the pirate operations, she will not make any comment about it, or face any kind of punishment for her role in the attacks. Her logbook refers to her as male. Suvaris will have a conversation with Ambarys about her work for the Cruel-Seas, despite her not working for them. This line of dialogue either confuses the Cruel-Seas for the Shatter-Shields or it was accidentally written for Suvaris and not Idesa Sadri, a Dunmer in the employ of the Cruel-Seas. This page was last modified on 12 June 2014, at 21:23.